Decisions to seek the death penalty are often made on a county level, leading to clustering of death penalty cases within states. 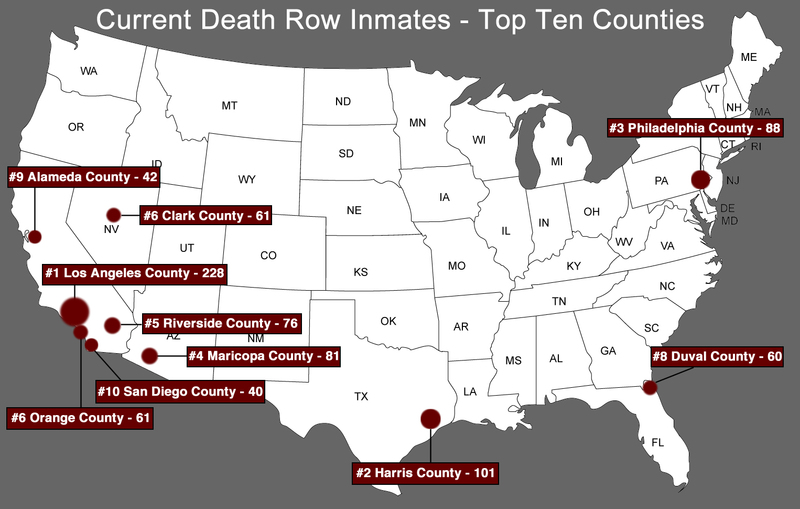 Although we have not determined the county of sentencing for every person sentenced to death, we have identified the county for each person currently on death row. The map below is based on the county of sentencing for all inmates on death row as of January 1, 2013. These ten counties account for over 27% of all death row inmates as of 1/1/2013, but they represent less than 1% of the counties in the U.S. and less than 1% of the counties with the death penalty in the U.S.